My new favorite book in the series! What a wonderful story!! Jillian is forced out of her job (a very shocking situation) and she decides to go to Virgin River for a while to think about what she'll do next. Collin Riordan is healing from the injuries he suffered on a helicopter accident and rents a cabin in Virgin River. The romance takes its time and its so well developed. This is definitely the best book in the Virgin River series. The secondary story about a young man named Denny that goes to VR looking for his birth father is really interesting too. Oh and the end of this story brought tears to my eyes. So good and so believeable! Narration: it's Therese Plummer! She's simply the best narrator ever. Nobody adds emotions to a book like her. Different and perfect voices for male and females. She has kept the distinct voices of each character for all the fourteen books.Best. Narrator. Ever. I just love listening to the Virgin River Series. 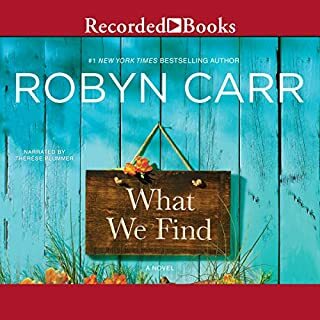 Robyn Carr does such a great job developing these likable characters. Start from the beginning and don't stop until you've read them all. LOVE VIRGIN RIVER, LOVE THERESE PLUMMER!!!!!! If you could sum up Wild Man Creek in three words, what would they be? I love Therese Plummer! I have bought books just because she was the narrator!! She's amazing, I even like her male voices. Every Virgin River books is an addiction for me! Can wait to start, can't stop listening and SO sad when it's over. Carr hits another homerun with yet another Virgin River romance. 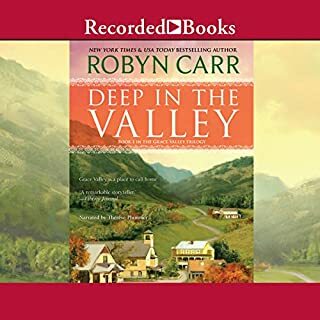 Again, I love the characters in Virgin River, Carr gives such attention to detail in fleshing out each character she introduces....opening the door for them each to share their story in the next Virgin River romance. Wonderful escape! Carr's Virgin River books are nice stand-alone's but even better when read as a series. You cannot help but fall in love with each person she introduces to the community and enjoy "visiting" with them again in future books and glimpsing how their life is progressing..
Would you listen to Wild Man Creek again? Why? Yes, good tension among the characters and sweet story. The characters are "normal" people with "normal" problems. More real and less a fairy tail. 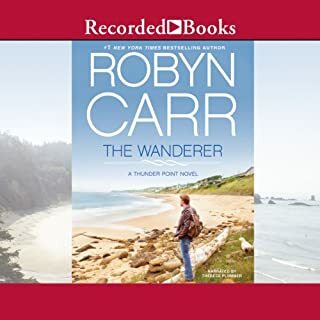 Ms Carr holds your interest throughout, surprises you and I can't say enough about the narrator. 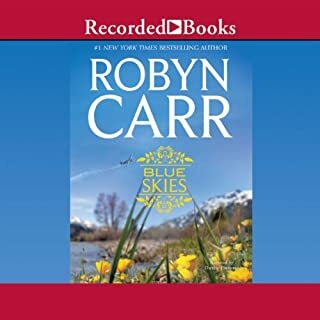 This is the first Robyn Carr book for me. 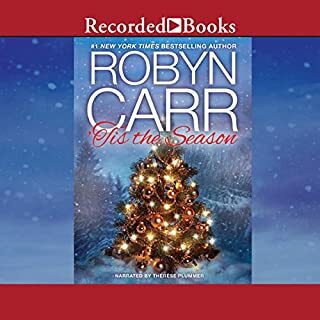 What drew me to it was the story line of the injured army pilot who comes to Virgin River to heal after his helicopter crash, and Jillian the young corporate executive who leaves that environment for some "time off" to think. I loved the way that Jillian found her roots and real satisfaction in gardening, and that the experiences that she shared with her grandmother as a young child served to comfort, heal and teach her so many years later. Colin's story of flying helicopters in the army and his shallow relationships prior to meeting Jillian were not surprising. I would have liked even more development of the relationship between Colin and Luke and the rest of the brothers, more about Colin's painting. 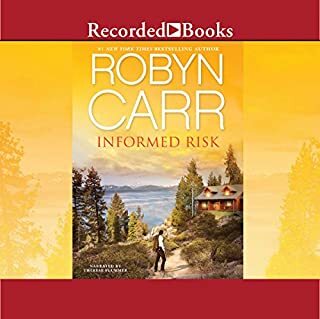 What I found to be shallow and underdeveloped in this book, and I suspect in this series, is that the relationship between Jillian and Colin never really went beyond Robyn Carr's descriptions of their love making . . . which she repeatedly writes about. Younger women reading this series will surely have "stars in their eyes" and I just find it lacking in substance. Yes, I have listened to other performances of Therese Plummer and I have to say she did a superb job with this book. She totally conveyed the feelings and emotions of all the characters in this book. The Virgen River series started out really strong but as the book countdown progresses, I am finding harder and harder to remain engaged. It was nice to see some of our old couples. The author did keep the principal romantic plot front and center better than she normally does. However, I found the big corporate exec turning veggie farmer to be somewhat unrealistic. Colin was so unlike his brothers. He was arrogant and just lacked the romantic characteristics that made the other characters stand out. But, I guess there is always a black sheep in every family and Colin definitely fit that perfectly. I am not sure whether or not I will continue reading the rest of this series but I have already committed so much time to it, I probably should just see it thru the end. We will see! Yes. Great story, great narration. 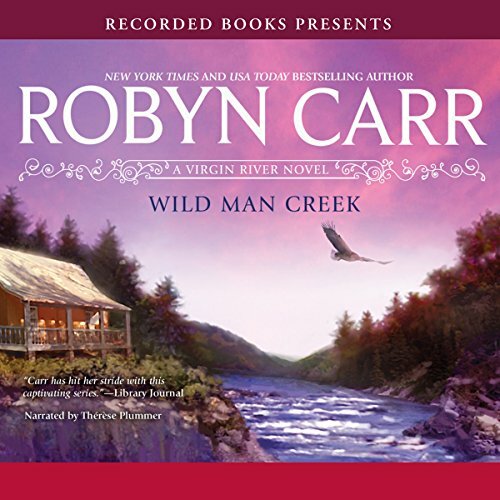 What other book might you compare Wild Man Creek to and why? I have read almost all in the series and they are all excellent. In giving the charaters a "voice" she it brings them to life in a different way than when you read a book. I spend hours a day in my car and this is wonderful. Not too bad man creek! I enjoyed the first half of the book but it became a bit boring near the end. Predictable - not very exciting! Would you listen to another book narrated by Therese Plummer? Yes - it was good how Therese changed voice to suit character. A few more descriptive romance scenes.